We are excited to invite you to support Yogamour by attending the following Events! Day of Wine, Spirits, Chocolate Galore & Yogamour! 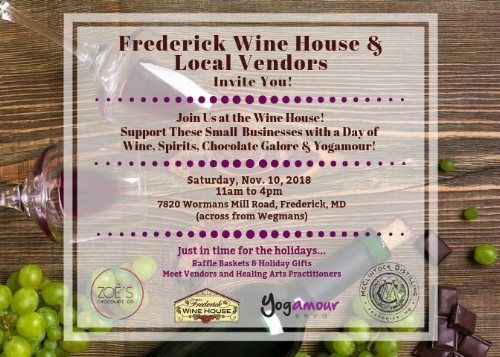 To join us on Saturday afternoon on November 10 from 11am to 4pm at the Frederick Wine House to meet Our Healing Arts Practitioners at Yogamour and your local vendors. We are so exciting to be hosted by the Frederick Wine House in collaboration with Zoe's Chocolate and McClintock Distilling in introducing what each vendor brings to the community! This will be a wonderful opportunity to get ready for the Holidays!